I’ve always been a bit of a frustrated archeologist — it was a road started and then not taken. But my youth was full of books about Hittites and Ancient Egypt, watching Michael Faught examining arrowheads while babysitting us, volunteering at the museum in downtown Tucson putting storage pots together — but of course volunteering was not sustainable for a poor kid without a car. I got a minimum wage summer job and that was that. There is such richness here, but not having a car (again the car) makes everything a little difficult. It was a bit of a surprise getting here on a lovely walk from Pensford, an easy bus ride from Bristol. It was in an old guide book (though surprisingly accurate and nicely sarcastic) and mentioned the neolithic stone circle as an aside only. Some extra scenery. I have since looked up, only to find it is the third largest in the UK behind Stonehenge and Avesbury. In finding out more, there is the English Heritage site, but if you want the really detailed and juicy stuff, you can look at ‘Stanton Drew 2010’, a report by John Oswin and John Richards, of the Bath and Camerton Archaeological Society, and Richard Sermon, Archaeological Officer, Bath and North-East Somerset (BANES). They include in their report an 1896 drawing done by Charles Dymond, a railway surveyor. Quite simply it is beautiful. But really, it was nice to discover for ourselves, to measure out the circle with our steps and let our fingers trace the stones. Then come home and add more layers on to that. Though I’d like to go back. 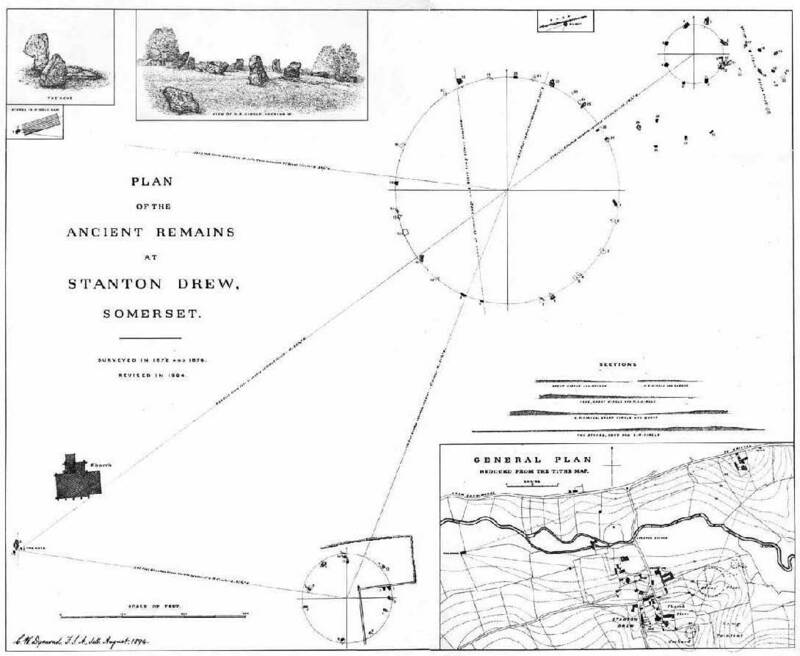 The visibility of the monument site at Stanton Drew from the surrounding countryside might have been an important factor in the location of the site. Higher ground surrounds the low ground of the River Chew basin where the stone circle site is situated and an approach from a low level would have meant that the site could not be seen, the seclusion giving a sense of privacy…Streams enter the main river here from Dundry and Norton Malreward to the north and from the Stanton Wick area to the south… During the Neolithic many sites were placed close to rivers, water sheds and water sources as can be seen at Stanton Drew. We approached from the south, there is no real view of the water. The stones from the beginning fascinated me, most of them in the great circle rusty red, pitted and starred with tiny crystals and geodes, festooned with spiderwebs and lichens. The rocks have a glassy, metallic appearance and feel and the surface has been described as pitted, pock-marked, frothy, knobbly and gnarly. There are abundant quartz geodes that make many of the stones sparkle, William Stukeley (cited in Lloyd Morgan 1887: 39) remarks that “it shines eminently and reflects the sunbeams with great lustre”. Quartz was a highly significant and regarded material in prehistory as indicated through its use in various monuments (Lewis n.d.). There are some silicified fossil fragments from the remains of limestone clasts within the conglomerate. The surface of the blocks resembles a limestone pavement and there are numerous natural cup-shaped depressions and pits that partly fill with water. At many rock art sites flat slabs of stone are found that are open to the elements and after rain, any cup-and-ring marks fill with water; also rocks with natural cup marks are often utilised for the same effect. It could be that places where rocks ran with water or held water were culturally significant in many ways (Fowler and Cummings 2003: 10). It is possible that some of these limestone slabs at Stanton Drew were not intended to stand or were intended for use as capstones. There was an interesting grouping inside the circle, being resolutely occupied by a middle-class family with no conception of sharing or situational awareness. We hovered for a while, but eventually moved on. We were paused in the middle of an eight+ mile walk after all. The southwest circle has a very different feel, more elevated, the rocks much smaller. The SSW Circle is situated in a more prominent position on a brow and commands a wider and more panoramic view of the surrounding countryside particularly when looking to the west along the valley towards the Severn Estuary where the high ground of Blackdown and the Mendip Hills is clearly visible. The different positioning of the SSW Circle might suggest a differing thought process or even a different period of construction. Archaeologists are becoming increasingly aware that monuments help to shape the perception of landscape, possibly altering both the form and content of a landscape; helping to promote and create senses of time, place and notions of identity and belonging (Goldhahn 2008: 57). It is then feasible that monuments were constructed to occupy a permanent place in the landscape and were intended to exert an influence on any future occupants of that landscape. Is that not what we do as planner, as activists, as community, as architects? So the question is what senses of time, place and belonging are created here, and what do we seek to create in our time? And how many ways is this contested, subverted? What brilliant imaginings this inspires. I am thinking. It makes me want to write, fiction is perhaps the best way to explore such thoughts. The village of Stanton Drew is lovely, the cat was immensely friendly (joy), and the pub good. As we drank down a pint and ate lunch, this became the scene of prayer and grief by a circle of friends or possibly family, history a palimpsest perhaps. These stones still hold meaning. I rather love the history of archeology itself, and the stories of myths and theories that arise around such sites, and how people’s treatment of them has changed over time, this report does not disappoint on that front, which is lovely. The first mention of an archaeological find at Stanton Drew is by an anonymous source writing in 1666 or later: “… (a stone) being newly fallen, in the Pitt, in which it stood, were found the crumbes of a man’s bones, and a large horse-bell, with a skrew as the stemme of it” (Hearne 1725: 507). This is reminiscent of the discovery of the barber-surgeon’s remains under a stone at Avebury (Smith 1965: 177–8). There have been changes to the stone circles in the last few centuries. Aubrey (Aubrey et al 1980: 47) wrote in 1664 that the villagers break the stones with sledges to get them out of the way, and he was told they were much diminished in the last few years. Later, the villagers would tell Seyer (1821) that a century earlier many stones were broken up to mend the roads. However, the villagers then seem to have decided to leave the stones alone, and Long (1858) said it did not appear that any stones had vanished since Stukeley’s visit in 1723. The John Woods, father and son, the Bath architects, visited the site (Wood 1749), (Wood 1765). John Wood, the son, claims to have carried out an accurate survey. His text does indeed support this, but his diagrams are fanciful, being aimed at proving his intent. Our little guide book noted that the measurement of Wood’s Moon Crescent in Bath is based on that of the great circle. Some stones were toppled deliberately. It seems this was also done at Avebury in medieval times and the stones left lying on the surface; other stones were buried in pits. The purpose cannot have been simply to clear the land for cultivation as it was not particularly effective, and it is assumed there was a superstitious motive (Smith 1965: 176, 179–80). The most persistent tale is that the stones are the petrified members of a wedding party and its musicians, lured by the Devil to celebrate on the Sabbath and thus being punished for their revels. Which sounds like the myth that exists for every group of standing stones anywhere. Either villagers or priests or note-takers of history had very little imagination.